That was a very real issue for men and women across the globe in the first half of the 20th century. Many had already suffered through the atrocities of the supposed “war-to-end-all-wars” only to find the stage set for fresh horrors. The wallowing misery of The Great Depression. The firebombing of Dresden. The gas chambers of Auschwitz. The unimaginable devastation of Hiroshima and Nagasaki. Faced with an utterly capricious and indifferent universe, men and women across the world questioned if there was any point to it all. Was there anything that made existence worthwhile? For iconoclastic French-Algerian thinker Albert Camus, the answer was a resounding yes. Born to an impoverished French family in what was then the colony of Algeria, young Albert very quickly learned that life isn’t fair. His father died of battle injuries during the First World War. His mother worked as a housekeeper, barely able to support herself and her son. Albert himself attended university on an athletics scholarship, and had what seemed to all a promising soccer career ahead of him – only to have those hopes dashed when he contracted tuberculosis at the age of seventeen. Camus recovered enough to serve with the French resistance during WWII but he eventually fell out with several notable comrades, including lifelong frenemy Jean-Paul Sartre and Simone de Beauvoir. Camus’ own life would come to an abrupt end in a car accident at the young age of forty-six. In spite of all those hardships, Camus produced one of the most defiantly optimistic philosophies of the twentieth century, and in these trying times we live in, it’s one we can learn a lot from. Camus is considered an existentialist, and along with his fellow existentialists he rejected the idea that the universe has an innate purpose (one we can comprehend, anyway). Living in the absurd isn’t just a tough position, it’s an agonizing one, and confronted with that inescapable situation, Camus believed every person had to pick one of three choices: suicide, “a leap of faith,” or recognition of the facts. While Camus’ own understanding of the reasons one might have to take their own life was, well, a bit ignorant and insensitive, he was coming from a place of sincerity. Suicide, as he saw it, was an admission that life wasn’t worth living. To use a sports analogy, it was recognizing that the points scored in a game didn’t really matter, so why not just forfeit? For Camus, that was unacceptable. He also didn’t care for the second option. The “leap of faith” or “philosophical suicide” was Camus’ term for the very understandable tendency to tune out the reasoning, doubting, questioning part of ourselves in favor of some comforting narrative. That might be religion, or binge watching Netflix entire back catalogue. But it could also be blind acceptance of anyone or anything that claimed to have all the answers. For many in Camus’ life, taking the “leap of faith” meant turning to totalitarian ideologies like Fascism and Stalinism. For others, it was consumerism, or mindless faith in science, or the cheesy books that fill up the self-help section in Barnes & Noble. 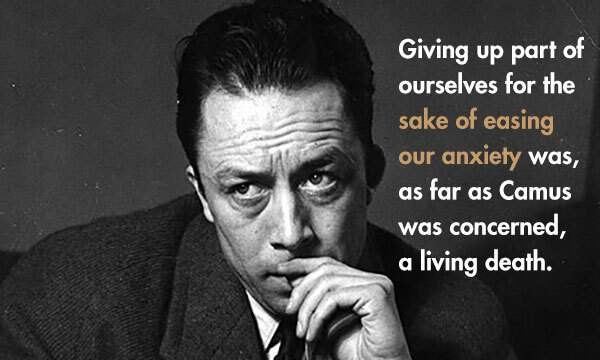 Giving up part of ourselves for the sake of easing our anxiety was, as far as Camus was concerned, a living death. For him, there was only one admirable option: rebellion. 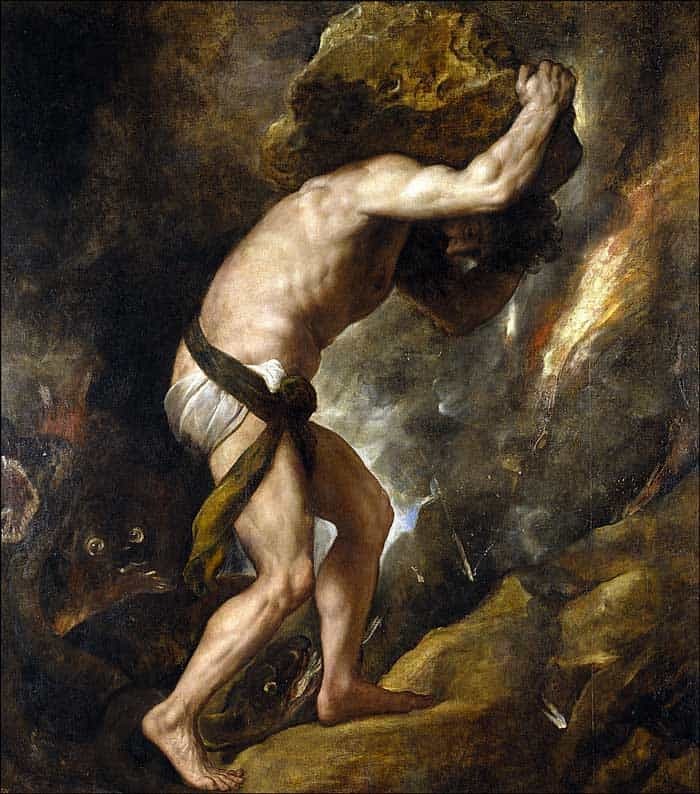 In his most famous example (perhaps overshadowing the man himself), Camus offers the example of the Greek myth of Sisyphus. As punishment for having kidnapped Death (because that’s just how Sisyphus rolls), Sisyphus is damned by the gods to push an enormous boulder up the side of a mountain. Upon reaching the summit, the boulder rolls down the other slope and Sisyphus must begin his task again, laboring in Tartarus forever. While the thought of it might make us shudder, Camus points out that we’re not so unlike Sisyphus. We get up, work, eat, sleep, and repeat – all with precious few breaks from the cycle. Like Sisyphus, our efforts and accomplishments are ultimately meaningless. For all stress, straining, and ingenuity, there’s no accomplishment or legacy that time won’t eventually erase (can you name the winner of the Nobel Prize for Literature in 2012? The world heavyweight champ in 1934?). But in spite of that, it’s still alright. In fact, for Camus, finding happiness in spite of the absurd was it. Consider every sports game you ever played. The meal you ate on Thursday three weeks ago. The pictures you drew as a kid. Do any of these things matter to the universe? No. Does that mean they weren’t pleasant and worthwhile? Of course not. “Real generosity toward the future consists in giving all to the present” Camus tells us. Real defiance in the face of an indifferent universe (or petty Greek gods) means us being able to throw ourselves enthusiastically into our efforts while still realizing that they’re not going to last. It’s a lesson Camus learned in his soccer days. We should be able to throw ourselves into a game enthusiastically, giving our best efforts and taking joy in it all the way. At the end of it however, it is just a game, and we need to recognize how fleeting it all is – that awareness will make us humble in winning and hopeful in defeat. The points don’t matter. The cleats come off. The field is just as empty as it was before. Still was one helluva game. If Sisyphus can find happiness in an endless, meaningless cycle, then perhaps we can as well. For all his talk about Sisyphus being happy in his endless damnation, it’s important to understand that Camus is not offering us some kind of perpetual bliss. Nothing could be further from the truth. As much as we endeavor to live in the present, as much as we acknowledge the absurdity of the human condition, we will always find ourselves yearning for more. While consumerism tells us that we’ll finally be complete when we buy that shiny new thing, and while other philosophies will tell us that discipline and self-denial is the key, Camus argues that we will never be satisfied. More importantly – we’re not supposed to be satisfied. Hungering for more isn’t a sign of a deficiency, ingratitude, or moral weakness on our parts, it’s a healthy and natural instinct. After all, what if we did get everything we wanted? What if we settled down and raised the perfect family? What if we finished that novel and it was as great a success as we could’ve dreamed? What if we checked every box on that bucket list? Would we expect that bliss to last forever? Would we – could we – be happy with nothing new to look forward to? 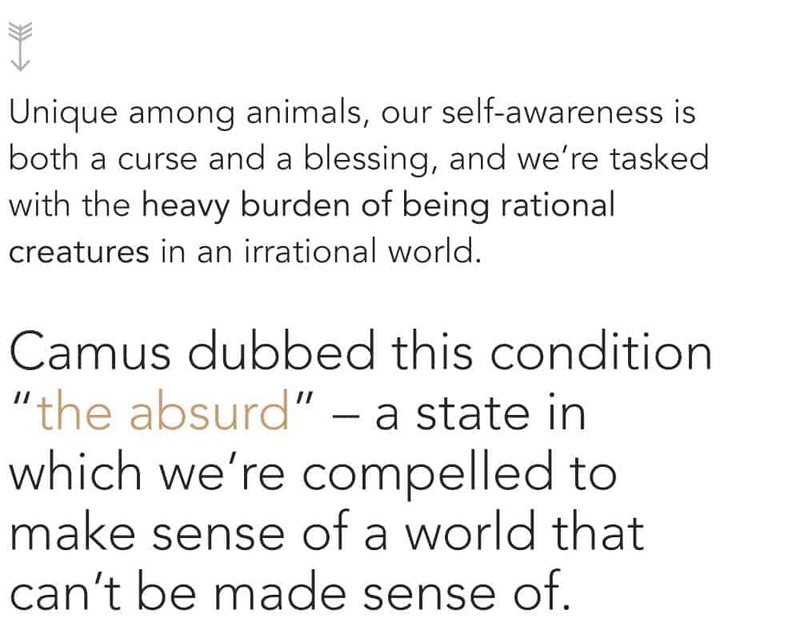 Regardless of whether or not you believe in his premise, Camus can still offer all of us a surprising challenge, and one that’s especially poignant for us at this stage in our lives. As individuals moving out in the world, and as Millennials in particular, it can often feel like there’s a critical need for us to get things right; An unbearable pressure to prove ourselves as capable, self-sufficient adults in a hyper-competitive world. And it’s not always easy. That strain can turn us into workaholics or even foster unhealthy coping skills. Our slightest error or misstep can feel like a devastating failure. In those times, Camus offers us a gentle, persistent reminder to take ourselves (and everyone else) a little less seriously. To stop imagining that the fate of the universe hinges upon us because it absolutely doesn’t. Getting that promotion, that apartment, that package probably matters infinitely less than we might first suppose it does. It’s not the end of the world, and even if it was, it still wouldn’t matter. But that’s not to say that we should despair – not for a second. 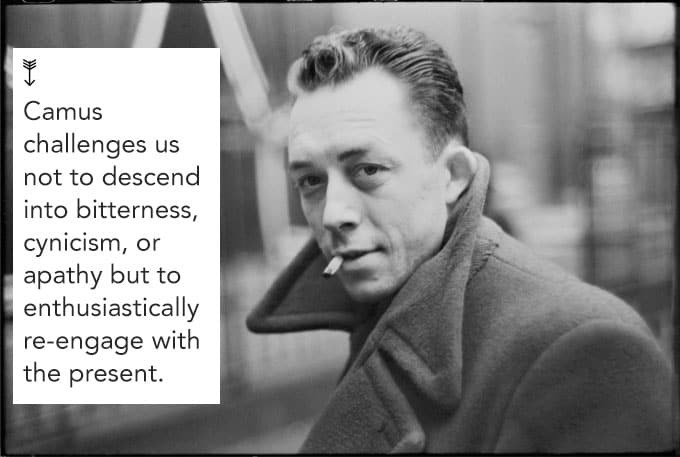 Camus challenges us not to descend into bitterness, cynicism, or apathy but to enthusiastically re-engage with the present. To allow ourselves to love, to lose, and to love all over again. To defiantly grapple with the strange world we live in and to always come back for more. The choice that faced Camus’ generation faces us as well. The Stranger by Albert Camus – Earning Camus the Nobel Prize in Literature, The Stranger is the perfect starting point for anyone interested in Camus’ philosophy. Seventy-six years after its publication, this short but powerful novel remains a compelling call to resistance as we follow the misadventures a young man pitted against and strange, senseless, and hauntingly beautiful world. The Myth of Sisyphus: And Other Essays by Albert Camus – The most famous and foundational of all of Camus’ many texts, The Myth of Sisyphus serves as a manifesto for living a full and free life in the face of an impassive universe. The Rebel: An Essay on Man in Revolt by Albert Camus – For anyone enticed by Camus’ iconoclastic ideals, The Rebel is a perfect next step. In this lengthy essay, Camus explores the application of his optimistic individualism to our own lives and offers a stirring picture of the way the world might be. This was a very interesting read and a well-written article. I’m officially adding The Myth of Sisyphus: And Other Essays to the ever-growing backlog of books to read.